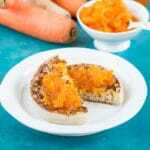 Try this tasty and intriguing carrot jam with parsnip; our easy small batch recipe is a perfect introduction to making vegetable jams! One of the things that I really love about making small batch jams is that I can really play with ingredients and flavours, and if it goes wrong I wouldn’t have wasted too much food. 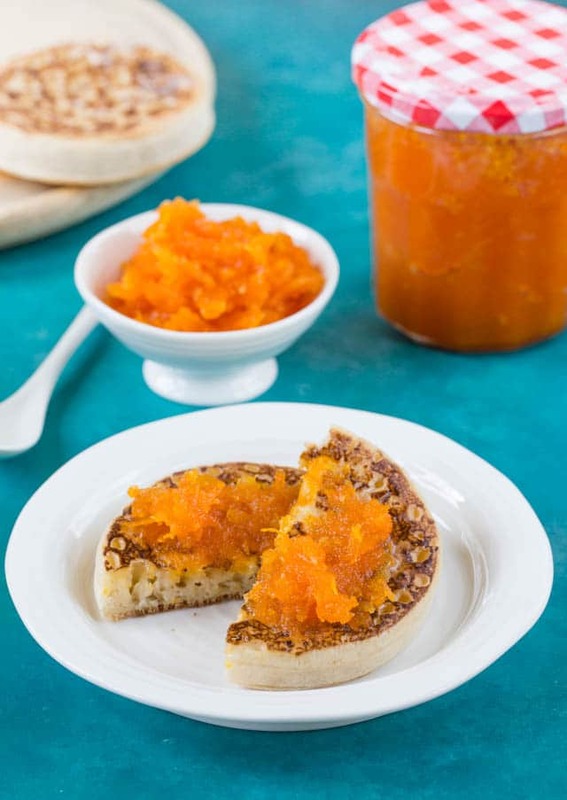 This recipe only makes one jar of carrot jam, so a perfect amount for experimentation. If you like it, success! If not, it’s no great loss. Also you do not end up with stacks and stacks of preserves in the cupboard – I made so many at one stage that it has take about 7 years to work through them all! Aged is better, but my stash was slightly over the top. At first thought carrots are not really that obvious a choice for a jam, but once you remember that they really are quite sweet; and often used used in sweet baked items such as carrot cake and Indian desserts like a carrot hawla, it becomes a less odd choice. I’m not entirely sure that carrot jam jam is a legitimate way to my general diet of philosophy of Extra Veg – but every little counts surely? In fact, carrot jam has been around for at least 150 years: Mrs Beeton included a recipe for it in her 1861 book of Household Management but there is no sign of it in the 1,200 recipes in my copy of her 1890 Cookery Book (the Victorians had the right approach in my opinion, few books with far more recipes). She describes the recipe as a poor man’s substitute for apricot jam; I can see what she means – my jam did have a hint of apricot, but we thought it tasted far more of marmalade than apricot. I used both carrots and parsnips interchangeably in many dishes; carrot cake is just as good with sweet parsnips, and grated parsnips works just as well as carrot in salads and ‘slaw. 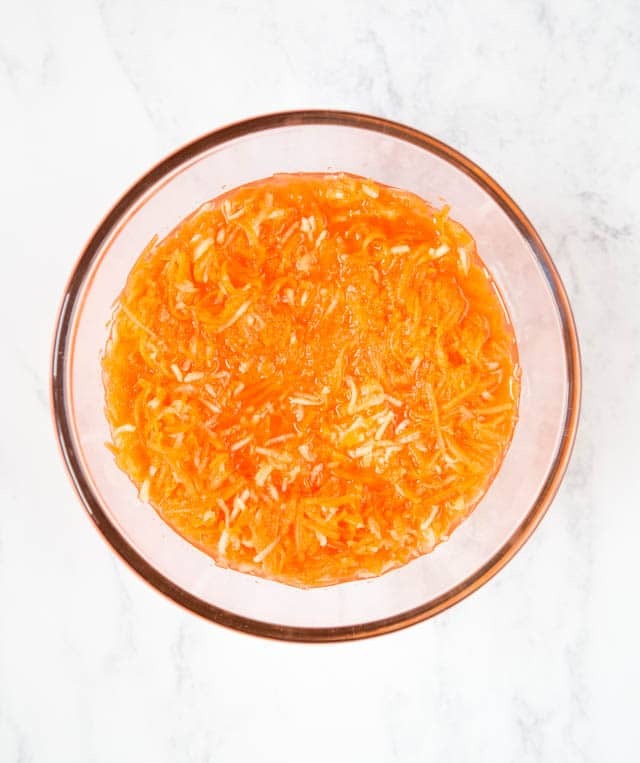 Given there was a spare parsnip languishing at the bottom of the salad drawer, I made this vibrant orange carrot jam with a mix of carrots and parsnips. The end result is more of a sweet vegetable spread. It’s doesn’t really have a jammy consistency, instead there’s plenty of texture from the grated carrots, and it’s certainly delicious. Serve on toast at breakfast, with cheese, on yogurt or porridge, add a spoonful to a fruit pie. I think it would be especially good mixed into the mincemeat for your Christmas mince pies too. I’ve made this using the macerating, conserve method where I cover your fruit (or vegetables) with sugar and leave it overnight to draw out the juices and form a thick syrup. Some recipes suggest cooking the carrots, passing them through a sieve to make a puree, then using this puree to make the jam. I think this is an unnecessary further step, so skipped it in favour of blitzing most of the carrot to a smooth puree half way through cooking, either in the food processor or with a stick blender. Less faff and certainly less washing up! I like the flavour of this (and most jams) as it is – celebrating the main ingredient, and in general I’m not a fan of lots of extra flavours being added. But if you must …. Add spices at the maceration stage – lightly crushed cardamom pods, a piece of cinnamon, slice of fresh ginger – remove before cooking or before spooning into jars, depending how strong you like the flavour. Add a little vanilla extract, grated nutmeg or ginger. Take out a tablespoon of the sugar and add a spoon of honey. 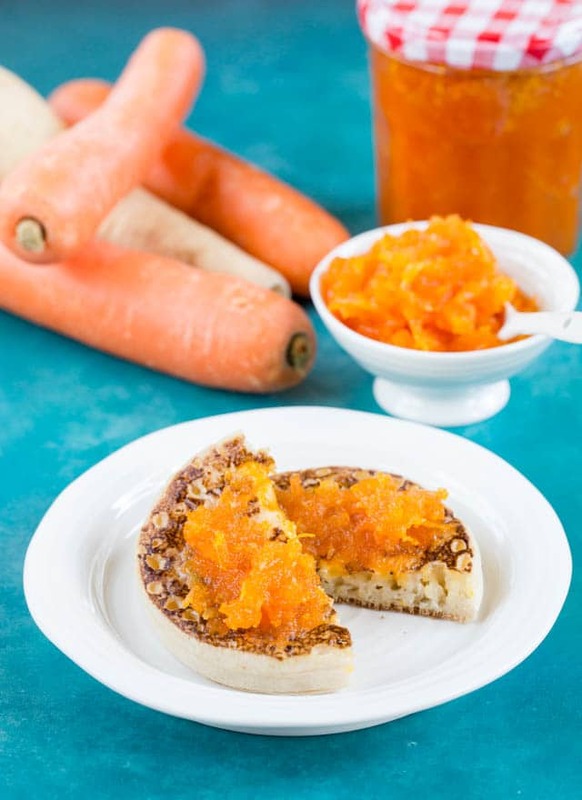 If you try this Carrot Jam with Parsnip – Small Batch Recipe please tag #FussFreeFlavours on Instagram or Twitter. It is amazing for me when for me when you make one of my recipes and I really do love to see them. You can also share it on my Facebook page. Please pin this recipe to Pinterest too! Thanks for reading Fuss Free Flavours! 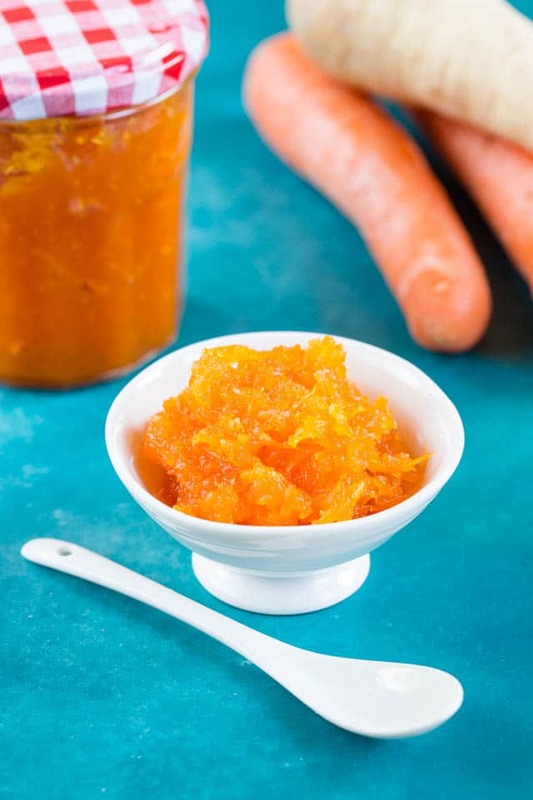 This small batch carrot jam has notes of apricot and orange. A delicious introduction to sweet vegetable preserves. Makes one large jar (300ml). Adjust the spicing to suit your taste. Place all the ingredients into a bowl and mix well. Cover and leave overnight to macerate. Place in a saucepan with a couple of tablespoons of water, bring to a simmer, cook for 5 minutes. Remove from the heat, use a stick blender to blitz to a puree, leaving some of the grated carrot whole to add texture. Use a jam or sugar thermometer to measure when the jam reaches 105C. Allow to cool for a few moments and then spoon into a warmed jam jar using a jam funnel and seal. Store in the fridge. Keeps a good few weeks. Add an inch of cinnamon stick or a few lightly crushed cardamom pods at the macerating stage. Remove before cooking.